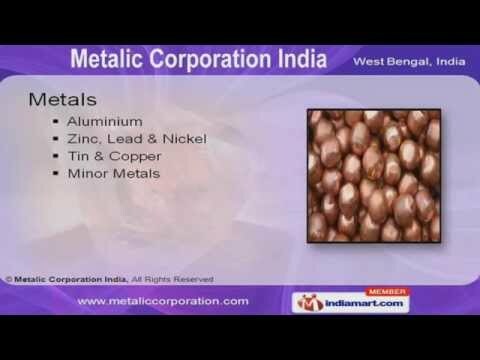 Welcome to Metalic Corporation India - Manufacturer & Exporter of Ferrous & Non Ferrous Metal Products The company was incorporated in the year 1987 at Kolkatta. We are associated with SAIL, TATA & other organizations. Owing to our ethical business practices and optimum quality products, we have become the first choice of our clients among our competitors.Our product range includes Ferro Alloys, Metals, Scraps, Minerals, Ores, Coal&#039;s & Cokes.We provide Ferro Alloy - Nobel & Bulk that are passed through strict quality checks to ensure sturdiness.Aluminium, Zinc, Lead, Nickel, Tin & Copper are some of the metals offered by us.We also provide Ferrous & Non Ferrous Scraps that are known for their features such as environment friendliness and superior quality. Along with that we provide high quality Flourspar Minerals, Burnt & Dead Burnt Magnesite to our clients.Our Magnesium Ores, Hard & Met Cokes are best in the industry amongst others.